You have the option to turn entire parameters (font, style, size) on and off in this dialog. Simply select or deselect the checkbox to the left of the parameter display. If you deselect the option, it will not be applied to your text passage when you hit . The font panel dialog can also be used to view the current text style. It always displays the settings for the area of text in which you cursor is placed. Use the button to select discontinuous blocks of text that match the dialog settings and assign them certain font settings as a group, or modify them in some other way. This dialog will appear when you open a document in Papyrus that uses a font which you don’t have installed on your system. 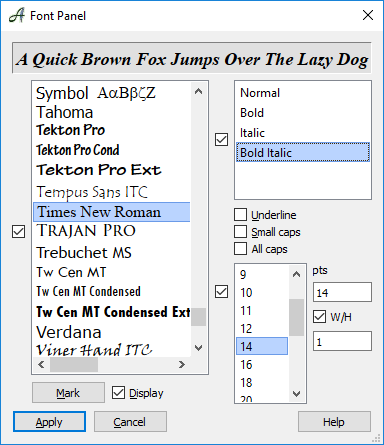 Choose a substitute font family in this dialog that you would like to replace the font not found in Papyrus. If the same font family appears again, Papyrus will automatically replace it with your chosen font. There is no need to repeat this step multiple times. 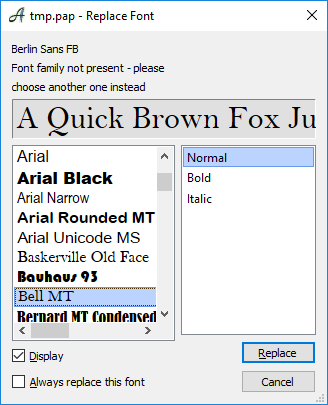 If you would like Papyrus to remember this substitute font and always use it in the future, you can select the box “ Always replace this font”. Of course if you install the “real” font for future use, this will take priority over the substitution.